Buick's Audiobook Integration and... I'm Going to California! Did you know that Buick drivers are 30% more likely to listen to books for fun? Or that Buick has recently decided to cater to us bookworms by offering audiobook integration in their new vehicles? It’s true! Not only is it true, but they are being so kind as to send me to California to test out the new service. Many of you know that I’m in love with Buick/GMC and share more photos of my Denali than necessary, so while I (currently) have a GMC, I’m a big fan of the brand. And books. Really, this is the perfect combination for anyone who loves books and drives a car (which is me). So, this weekend I’m packing my bags and heading to Big Sur, California to test out the new service. I’ve never been to California so while I’m excited about seeing the redwoods and the Pacific Ocean for the first time, I’m even more excited to find out how we readers can have more books in our lives. I’ll be live-tweeting the trip and sharing photos on Instagram using the #ThatsABuick hashtag, so I encourage you to follow along and learn more about what they have to offer and, of course, to show your support by proving that they didn’t waste their money with me. Also, don’t forget to come back next week for my full review! If you’d like to learn more about the new service, check out their press release, which was originally posted here. DETROIT – Listening to a new book is easy in a Buick, thanks to OnStar 4G LTE being standard on every 2016 model. 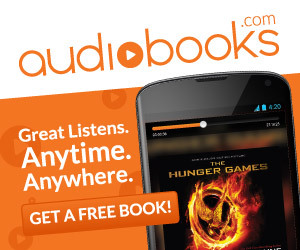 And thanks to Audiobooks.com, downloads of two books are free through the end of next year. Any Buick customer with an active OnStar subscription can redeem the offer through the RemoteLink smartphone app or a live advisor. The offer is part of OnStar AtYourService, a new platform that delivers value every day to drivers – from content like Audiobooks.com, to location-based offers at local, regional and national retailers, to hotel room booking services through priceline.com. According to Maritz research data, Buick customers are 30 percent more likely to read books as a leisure activity than customers of other brands across the industry. For 2016 Buick Regal or LaCrosse owners, the in-vehicle Audiobooks.com listening experience includes the smart and simple smartphone integration of Apple CarPlay. It allows drivers to connect a compatible iPhone running iOS 7.1 or higher via USB to view and control certain apps through the IntelliLink touchscreen. The Audiobooks.com iPhone app features CarPlay compatibility. Other Buick models, including Enclave, Encore and Verano, feature standard Bluetooth audio that allows streaming audio from a smartphone through the vehicle’s speakers. Every 2016 Buick in the U.S. and Canada comes standard with OnStar 4G LTE and a built-in Wi-Fi hotspot allowing owners to stream an audiobook using a smartphone’s cellular data plan or through the vehicle’s more powerful hotspot. All new vehicles include a data trial of three months or three gigabytes, whichever comes first. Buick is an international modern luxury brand offering vehicles with sculpted designs, luxurious interiors and thoughtful personal technologies, along with responsive-yet-efficient performance. Buick is attracting new customers with its portfolio of award-winning luxury models in North America and China. Learn more about Buick cars and crossovers at www.buick.com, on Twitter @buick, on Instagram or at www.facebook.com/buick. If you had this service, what audiobook would you download first?